Last time, the house was in mourning after the loss of the founder, Astra Astrum. 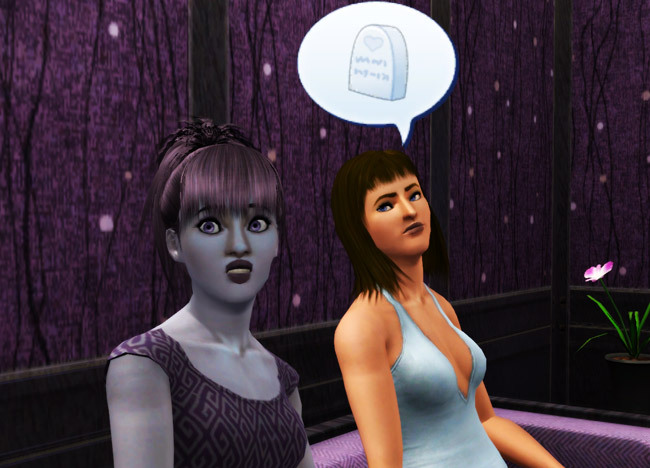 Little Artemis seems to have developed a bit of a morbid streak after seeing her grandma die. She wants to go to the graveyard. I’m putting all the stones there, since there’s no restriction on it and the ghost in this game really, really irk me. No, not cool, Artemis. 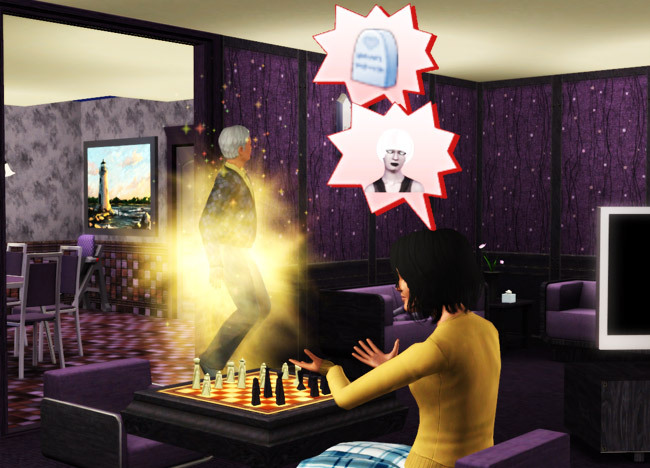 Ghosts are annoying and they visit your house and use your things without permission. Since reaching level 5 in Cooking, Diana has moved on to Science. She and Castor spend lots of time tending to the garden that Astra left behind in an effort to bolster their job skills. Now, I’m going to be honest–I’m not a big fan of what they did with science in this one. I love how they integrated fishing, gardening, etc into it… but Science appeals to genius sims… who have no desire to do any of the above. I’m left sitting here, thinking about my husband trying to garden, fix the sink, or even fish and all of those scenarios are laughable. Still, it’s Castor’s wish so a’gardenin’ he goes… I gave him (and everyone else applicable ever gets it) the Fast Learning LTR. It helps, but not much. I hate making him fix things because then he’s obsessed with it and besides, it’s Margot’s job and love to repair and tinker! Speaking of Margot, she’s throwing a fit. Poor Christopher’s time is up. I am not amused that this happens just as Astra’s mourning is about to wear off. Thanks so much, game. Because I totally want to deal with back-to-back mourning insanity. Miss. Crazy Pants seems both afraid of the Reaper and intrigued by it. Grimmy didn’t drop by for Astra’s because he couldn’t reach her, so she didn’t get all this fanfare and ridiculous music. I could make a joke about Diana flirting with death here, but I prefer to think of Grim as gender neutral. Artemis becomes a surprisingly lovely teenager. It would seem she did inherit some of Margot’s traits–namely her facial structure. Very nice. It all blends well with the rest of Artemis’ features, which she got from Castor. I am definitely glad I picked her to be the heiress. Okay, no I can’t! She seems to have inherited Castor’s ridiculous face pulling skills. There’s no way I could replace her after pulling a face like that, though she is talking to Diana, so I don’t really blame her. Calm down, Artemis. It’s Diana… she’s crazy, remember? Would you really tust her word over mine? Wait, don’t answer that… but just be assured that listening to Diana is not recomended. Again with the bizarre faces, Artemis? I already said you were heiress, sheesh. Castor becomes an Adult and gets some wrinkles for his time spent. Margot looks wholly unimpressed by the whole thing. 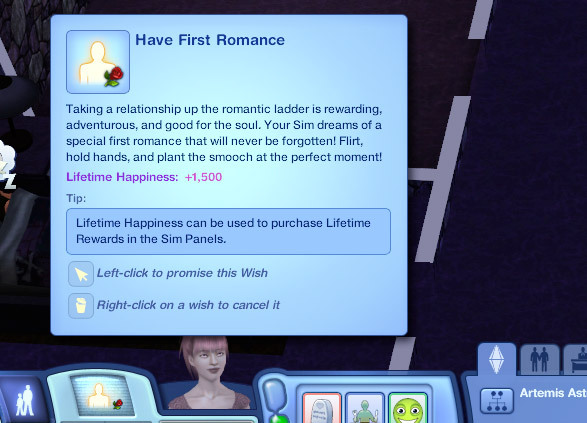 Artemis finally spins up her first Hopeless Romantic wish… Have First Romance. I promise it simply for humor’s sake. I don’t really intend to just set her up with any of the random townies (in an effort to hope they continue breeding themselves with the mod), but it might be good for some laughs. Sure it is, everything you do is. Such is the nature of this challenge! 4 comments to Generation Two: Now With 10% Moar Death! Do you happen to remember what that moodlet Artemis has in the first picture is? The one with what looks like a shiny cooking pot? I’ve never seen that one before! When I saw Artemis passing out, I thought maybe you weren’t letting Artemis sleep! 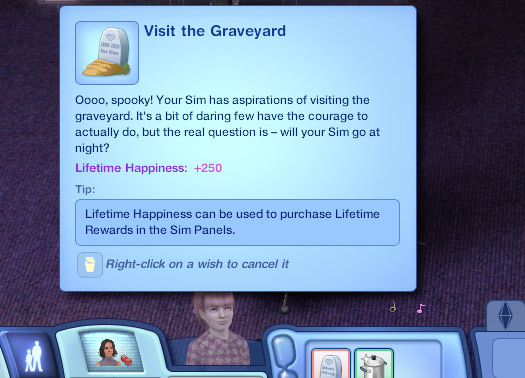 I’d forgotten about No Sense of Humour Sims. I love Leo. That kid is totally heading for emo-ness as a teen. He’s really cute though. I’m still glad Artemis is heir – best facial expressions ever! That’s extraordinary cooking something or another. It’s from the fridge you get from ascending the ranks of the culinary career. It gives a neat moodlet for any food prepared from it. LOL, Leo is such a moody little bugger and I love that Artemis inherited Castor’s bizarre facial expressions! You need to put a link on the main page for your family tree. For some reason I was thinking that Artemis was Gen 2 and you switched Heirs. So I had to dig through 3 different posts to figure out where the link was. LOL. Speaking of Artemis. She *is* lovely. Except when she’s making those faces that I’m sure she learned how to do from Castor. Artemis turned out well, I’m glad she inherited the silly faces. I think I’d miss them if they died with Castor, LOL!